But what has happened since? Without going into the details of, well, history, we entered an age in which sci-fi is overwhelmingly depicting a bleak future. Nuclear fallout, viral apocalypses, world-ending environmental disasters... the concept of doom has never been so appealing to us. Here's the thing, though - we may be seeing the beginning of a shift in the zeitgeist. Tomorrowland, and perhaps to a lesser extent, Interstellar, may be heralding in a new age of positive-minded sci-fi. Ulrich remarked that NASA and space exploration has seen a resurgence in public interest in recent years, sparked by the latest Mars rover mission - is it a coincidence that work on Tomorrowland began around this time? NASA's social media channels have exploded in popularity, Ulrich explained. The space agency's primary Twitter account has over 10 million followers. Its Facebook page? 10 million likes. Three million Instagram followers. And that's just a small sample of the agency's numerous social media outreach. I remember an episode of The Simpsons from the mid '90s that can be summed up in a single line of dialogue: "No, not another boring space launch!" Public interest in NASA seemed to be at an all-time low; but now? Well, numbers don't lie, and we're seeing some big numbers. Last summer, I wrote about why a space program is worth funding. Practical reasons aside, one way you can justify the existence of NASA is not unlike how you can justify the existence of sci-fi: the inspirational aspects. And that's what made Tomorrowland and NASA the perfect marriage - both seek to evoke a sense of wonder about the future and inspire individuals to step up and help take us there. During a time in which we are trying to increase the representation of women in STEM fields - science, technology, engineering, and math - Tomorrowland gives us a promising young female engineer as a protagonist. In a world where the greater culture - both fiction and news headlines - is focused on doom and gloom, Tomorrowland shows us a vision of a bright future that can be ours if only we would stop being resigned to a grim fate. 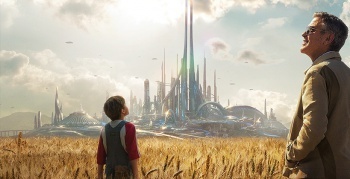 So can we fault Tomorrowland - a family film that includes children in its target audience - for being less than subtle in its delivery of its message of hope and positivity? I don't think so. NASA doesn't think so.